Explore Deep Space is a website dedicated to educating the public about the next big feat: deep space exploration. 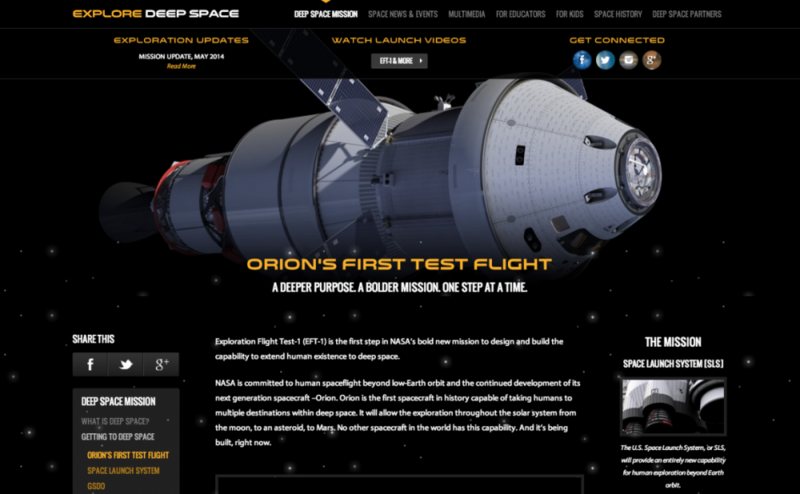 The website is a hub for information, news, and media on the Orion spacecraft, as well as the ongoing testing. The site features wonderful large header images, some taken by the Hubble telescope, as well as a responsive framework to make the site compatible with even the smallest mobile devices. In addition, a full-screen parallax page immerses the user into deep space exploration, and a Space History page features many important points in space exploration history. Other features include: WordPress CMS, multimedia galleries for photos and video, custom post types for a variety of content, and plenty of custom options and flexible fields to allow the client to create new pages quickly and creatively.